I’m sitting on the Frecciarossa three and a half hour high speed train from Milan to Rome. It’s great: I’ve got free wifi, a plug outlet for my computer, all the techie things we now look for in train and air travel.And my lunch? I just ate a hard-boiled egg I pocketed from the hotel breakfast buffet and I also have some fruit, yogurt and a few beverages to tide me over until I arrive in Rome. My meal reminds me of a story covered just two days ago on Italian television about London’s Kings Cross to Leeds full dining car service. 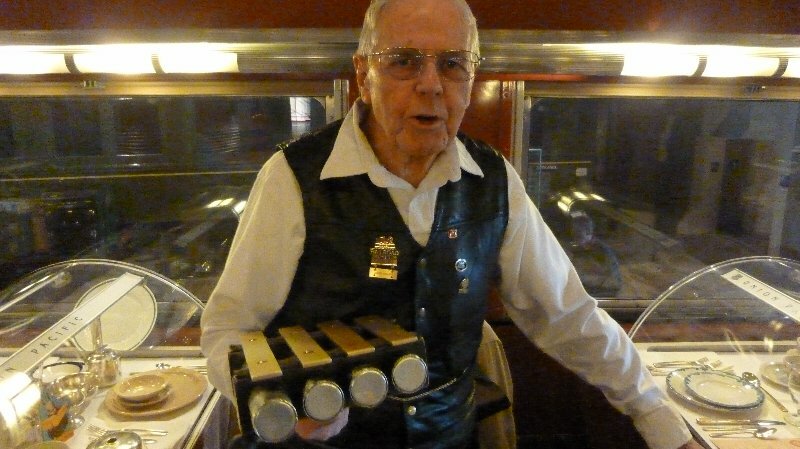 On May 20th the East Coast main line railway dinner service came to an end. There’s something imminently sad and nostalgic about seeing the disappearance of railway dining. It’s another form of slow food that you hate to see go. Instead we have roll-away carts with soft drinks, potato chips, candy bars and occasionally some not-so-fresh sandwiches on sale. 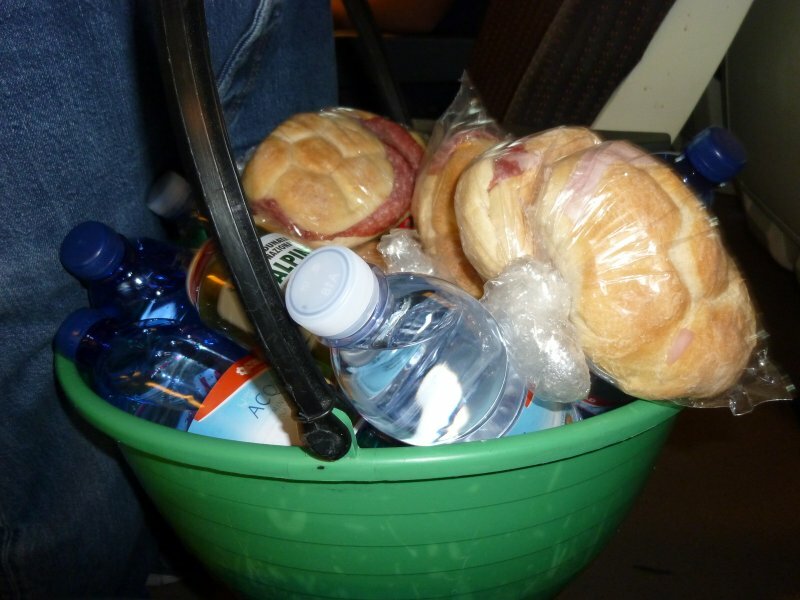 My train goes on to Naples after Rome so instead of a roll-away food cart an entrepreneurial Neapolitan man is selling homemade panini and water out of a water bucket. It’s great to get a lot of work and extra reading done on the train, but honestly I’d prefer to mosey up to a dining car for a full dinner service. My brother-in-law is a train fanatic so when we were in California in January we trained our way up to Sacramento to visit the state capital’s train museum. It might not be the first place that comes to your mind to visit when you’re in California but it’s well worth the visit. There’s a whole slice of American history within the museum, but what I was most drawn to was the history of American railway dining. 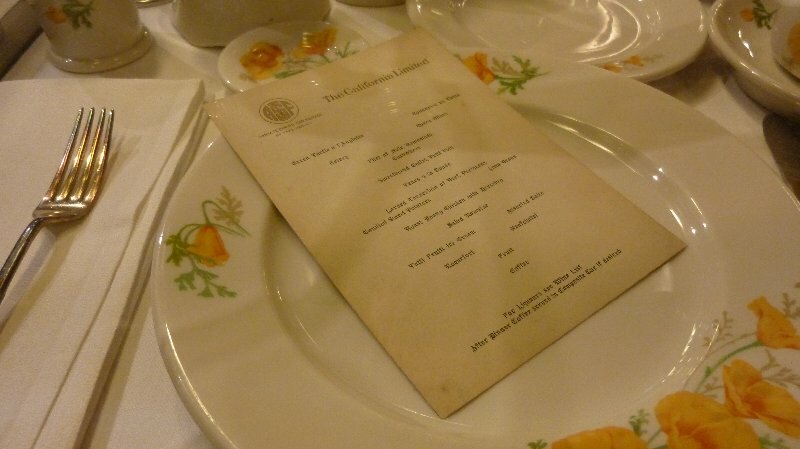 Railway dining was an event in and of itself, replete with great food, waiters, a la carte menus, and cutlery and dinnerware featuring the insignia of each line. The charming guide we had dates back to the days of railway car dining and enthusiastically showed us all the menus and dinnerware of the various lines. Here is a sampling of what you would have found in some of the West Coast’s railway dining cars. 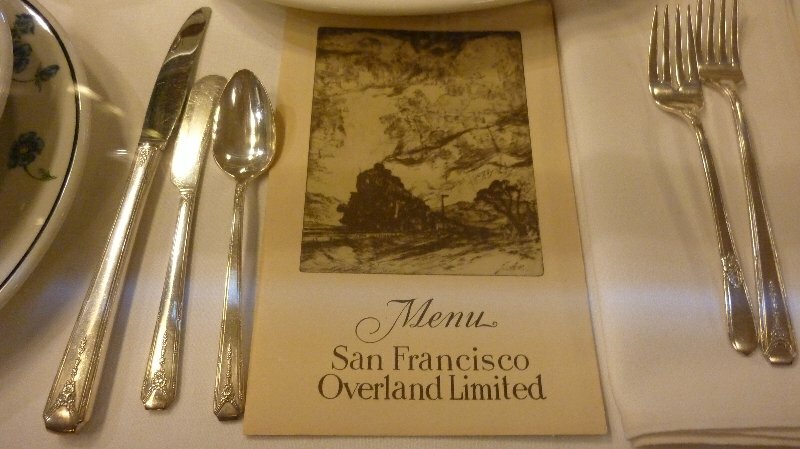 The cover of the San Francisco Overland Limited menu featured a detailed pen and ink drawing of its train. The line’s cutlery was exquisitely and intricately designed. 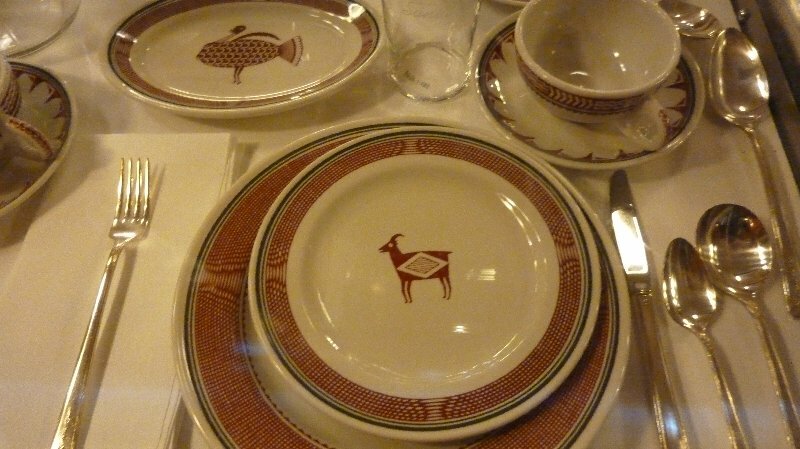 The Mimbreno china could be found exclusively on the Atchison, Topeka and Santa Fe Railway Dining Car No. 1474. The dining car was named Cochiti, after a 1,000 year old Indian pueblo in New Mexico. The car was later used as a restaurant in Tea, South Dakota. 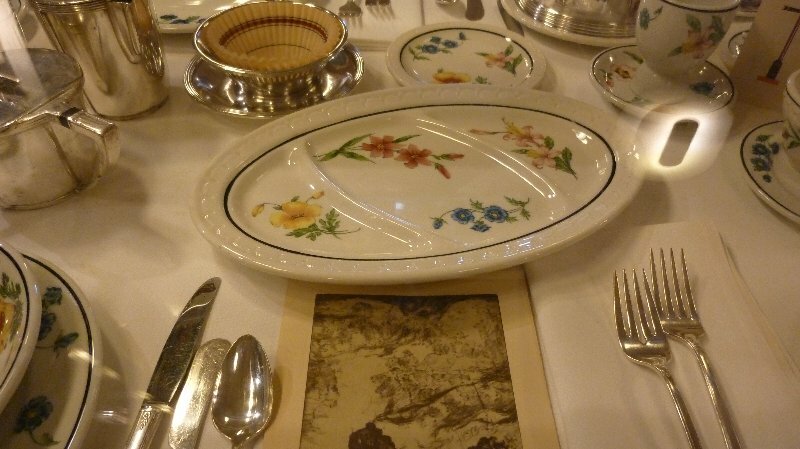 This delicate, flower-painted dinnerware was featured on the California Limited. Of note are some of the appetizing, and exotic, menu choices: Green Turtle a l’Anglaise, Larded Tenderloin of Beef, Perigueux and Sweetbread Cutlet. 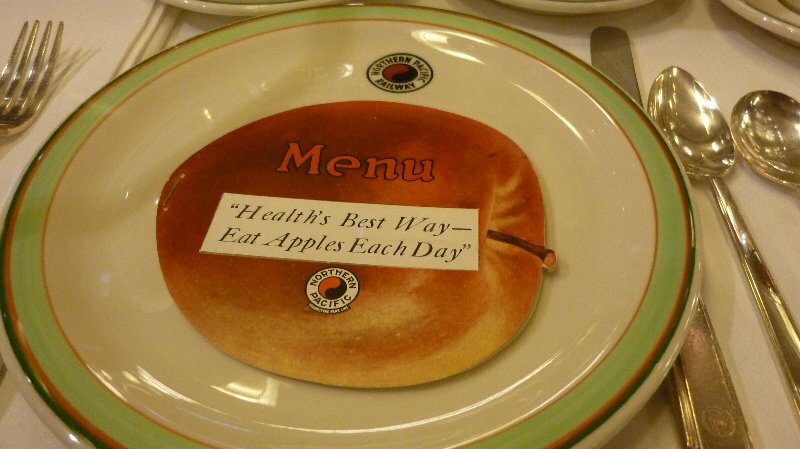 The healthy adage, “eat an apple a day”, was artistically conveyed on the Southern and Northern Pacific Railway plates. 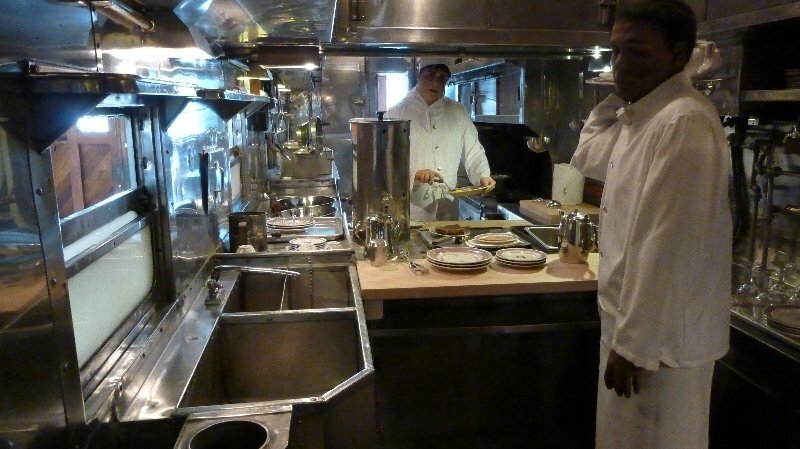 Although cooking space was tight on-board, the railway kitchens were probably no smaller than many restaurant kitchens. Although the days of fine dining on trains have mostly come and gone I thought it might be nice to capture the moment by owning some of the old dinnerware and cutlery. It is available, not inexpensively, through antique dealers buying and selling on-line. “The Official Guide to Railroad Dining Car China“, by Douglas W. McIntyre, will tell you everything you need to know on the subject. Careful though: this out of print book, published in 1990, currently sells for about $150.00, used.